This beer is a gift from my friend Dave. Dave was just traveling in Germany on business and brought back one for me. So to set the stage for this one, it’s a warm day in early June. We are visiting relatives in Front Royal VA. I just spent the day with the kids in the poor. It’s around 5:00 PM, I just fired up the grill and figured I had some time to review a beer. And what better beer to have on a warm afternoon than a German Hefeweizen. So lets get started on the this “Deck Side Review”. The beer pours a cloudy golden yellow with deep orange hues and a very rich bright white head. The nose is extremely inviting and just delightful with sweet citrus and banana notes on a wonderful yeasty wheat background. I can’t wait to dive into this. Literally, my mouth is salivating in anticipation. Man O Man did that hit the spot. What a perfect beer for a warm late afternoon. This hefe is amazing; sweet, effervescent light and refreshing, just what Doctor John ordered for himself. The experience starts out with light malt sweetness up front, then the most pleasant effervescence over the tongue in the middle of the sip. The back end is very easy drinking with an effortless swallow. There is a carbonation release during the swallow that adds to the refreshing aspect of this beer, it also masks some of the flavors during the swallow. The finish is delightful with sweet wheat malts, light citrus notes along with the classic notes of banana and a pinch of spice. There is little to no hop presence of the finish just enough to take the edge off of the sweetness. There is a slight lingering aftertaste of citrus with a touch of wheat and yeast. That creamy head has not quit. It has diminished somewhat but only to leave a very rich protective layer over the top of the beer. This creamy head is also adding a very smooth mouthfeel to this experience. Wow, what a great refreshing experience. As the beer warms a little the banana notes are becoming more predominate. This beer is also maintaining all the refreshing qualities as it warms and opens up. I have had more flavorful hefes but I don’t think that I’ve have one this refreshing. That was good! Man, I hated to finish this glass. This is a solid A for me. I may have had a more favorable Hefeweizen but I never had a hefe that was this refreshing. If I lived in Germany this may be my everyday beer. 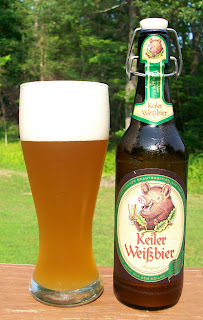 It could also be that since this was brought back from Germany it may be the freshest Heffe that I’ve ever had also. At any rate this was a great experience.